KC @ SD – Only one team scores fewer points per game than the Chiefs. The Chargers have their own issues, but their embarrassing loss last week should motivate them enough for a home win. Den @ Cin – Coming off their bye, the Bengals will look to stop a three game losing streak. Too bad they have to face the red-hot Broncos, who have scored a total of 69 points in their last two games. Bal @ Cle – The Ravens are hurting, literally, and the Browns are improving, but I can’t really believe that the outcome of this game will be surprising. Ravens. Ari @ GB – After a hot start, the Cardinals have lost their magic. And after a slow start, the Packers are back to normal. This isn’t a 1 vs. 16 seed match-up like last week, but the Pack should cruise. Buf @ Hou – After a little hiccup vs. the Packers, the Texans showed that they are the most complete team in the NFL. Coming off their bye, they look to smash an inept Bills team. Mia @ Ind – Colts games have been consistently hard to call this year. Both teams have a 4-3 record, but the Dolphins D is dominant and good on the road. Tannehill or Moore, shouldn’t matter. Det @ Jax – The Lions might not be stellar, but the Jaguars are just plain awful. They did keep up with the Packers last week, but they will remain winless at home. Chi @ Ten – The Bears have the best defense if football, allowing only 14 points per game. The Titans have the WORST defense, allowing 32 points per game. You do the math. Car @ Was – The Redskins can score with anyone, but their defense is sad. But the Panthers whole team is sad. The Skins & Obama will win. No joke, check it out. 95% Presidential Accuracy. TB @ Oak – The Jon Gruden Bowl! Neither team is that good, but the Bucs are statistically better in all categories. Freeman is hot and should light up the Raiders D.
Min @ Sea – Both teams have lost whatever momentum they created after fast starts, but the Seahawks D is for real, and that 12th man advantage hasn’t failed them yet. Pit @ NYG – The Giants dodged a bullet last week, but have played consistently well. However, the Steelers are the more desperate team, and I have a feeling Eli is in for a rough day. Dal @ Atl – Talk about desperate; the Cowboys entire team might be fired if they don’t win soon. I’ve been saying that the Falcons will lose soon, but perhaps they have one more week of perfection. Phi @ NO – Obviously, both of these teams have major problems. The Eagles can’t score and Saints can’t stop anyone. I believe Brees will shoulder his team this week and come away with a victory. What a refreshing take on a strange situation. Based on a true story, this movie definitely has the making of an Oscar nominee. It’s nice to see Helen Hunt in a strong role, and it will be nice to see a love story that’s based on reality, as opposed to fantasy (Safe Haven). Was it just me, or did no one watch the World Series? As a Cardinals fan, there was the emotional let down of the losses, but I’m not sure that’s to blame. I watched every game of of the Giants win two years ago and every game of the Cardinals win last year. Would it have been more popular had it been Yankees/Cardinals? Or is the sport losing popularity. Or is it simply that October is football time, not baseball. For whatever reason, and it’s just a feeling, but it seems as if the World Series was a flop. Well, it was a sweep. That’s not really that fun to watch I guess. What are your opinions of the Series and baseball in general? Will you watch next year? Or only if it’s your team? We all love Pixar films. I’ve never met anyone, adult or child, who wasn’t thrilled or touched by one of their animated instant classics. Whether it was Toy Story, Finding Nemo, or Up, there is just something about these movies that enthrall young audiences while captivating adults as well. And while these movies are great, WALL-E is the one that got me the most. It spoke to me in a way not many films have ever done, and left with that special feeling you get after watching something that you will never forget. In a story that starts out with upbeat music and a picturesque view of Earth from outer space, things go downhill quickly. We soon see that Earth is not what it once was. Mounds of trash higher than skyscrapers dot the landscape. Dust storms rage across barren land. And humans have completely abandoned the planet. All that is left are WALL-E units, whose job it is to clean up the mess. As the recent history of a space-bound human race is told, we meet perhaps the last working sanitation robot and his cockroach friend. 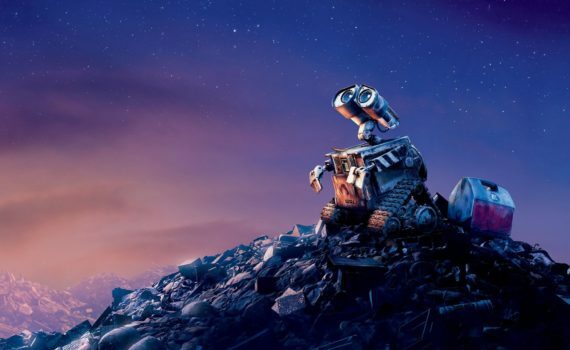 Soon, WALL-E will go on an adventure that changes his world forever, becoming the last hope for all humanity. It’s hard to put your finger on the exact detail that makes a movie phenomenal. With only a handful of lines spoken in the entire film, WALL-E speaks to us on a different level. From the way he loves others, to the music that means so much to him, to the way he views the world, this little machine has more depth of character than should be possible. The ‘lessons’ in this movie are fairly obvious, and the humans are one dimensional, but it doesn’t seem to matter. The feeling you get from start to finish is what’s important, and it’s both unexpected and uplifting. You can’t watch WALL-E partly invested; it forces you to immerse yourself into a wonderful story, and you come out changed. I’m extremely curious about this movie. It looks bizarre, but at the same time it might tell a story that is more real than most. Yes, Kristen Stewart is in it, but let’s assume she will be more Into the Wild Stewart and less Twilight Stewart. In a few days I will be voting to reelect President Obama. Now, I’ve steered clear of all political discussions & arguments up to this point, and I don’t intend to start one now. The majority of people I know have already made up their minds one way or the other and no amount of propaganda is going to sway them. However, on the off chance that an undecided voter is reading this blog, let me say that, as a moderate democrat, I see the President as the overwhelmingly obvious choice. Let’s do something that Washington can’t and put parties aside. If you like a small, capitalist government you’re going to vote Republican. If you like an involved, socialist government you’re going to vote Democrat. And if you’re like most Americans, you’re somewhere in the middle and you’re going to vote on character, likability, demeanor, and viewpoint. These things matter because, ultimately, the President is the face & voice of our nation. He’s not the lawmaker, that’s Congress. He’s not the diplomat, that’s the, well, diplomats. He’s the figurehead & spokesperson who’s party has a miniscule amount of control over things. Barack Obama is perhaps the exact individual we should want to represent us. He’s attractive, he’s a color other than white, he’s engaging, he seems trustworthy, and he sounds like he means what he says. These things matter when people around the world hear our President speak. We want the world to see America as a land made up of Obamas; not Bushes, not Clintons, and not Romneys. In a global civilization, image matters. Yes, you will be voting a party into the White House in November, but that party has very little say in very little. Obama’s main criticism is that he didn’t get much done over these part four years. One could argue that that isn’t true and could quote improvements. But that doesn’t really matter. What we should know is that no party can really do that much in any term because the other party will not let them. It’s the same every election, regardless of party. It’s the way our imperfect system works; the non-Presidential party must stop everything the President’s party tries to create so that in four years they can seem like the new and dramatic idea that will change everything for the better. This is exactly what the Republicans did to Obama, and it’s exactly what the Democrats will do to Romney if he wins. It’s stupid, but it’s true. So we’re back to the point; vote for a party if you want to, but understand that it doesn’t much matter. One party will push a bill, the other will reject it, and the President will remain the face of America, regardless of which policies are defeated. Vote for a person, because that’s what the President is. I will be voting for Barack Obama. I believe he is the person I would prefer representing me to countries around the world, some of which don’t like us. I voted for him four years ago for the same reason, even though I thought McCain was a great candidate. Yes, I’m a democrat and I believe in that party’s philosophies. There would have to be an amazing reason for me to switch to a Republican candidate, and I don’t see that happening. But in this election, I can be positive that I’m voting for the right person on both levels; in support of my party and in support of the man I want to be my face to the world. If you’re undecided, please consider this at the polls. I may have to add Julianne Hough (Ryan Seacrest’s girlfriend) to the coveted 5th spot on my List, but that doesn’t mean I have to watch this movie. Actually, I think I’ve seen it before. About a dozen times. Movies like this are created to entice women with a false fantasy, and they always work, but not on me. TB @ Min – Freeman looked good last week, but the Vikings are undefeated at home & the Bucs are winless on the road. The Purple People Eaters win. Car @ Chi – I will repeat myself; NFC North team undefeated at home, NFL South team winless on the road. Cutler is still a tool, but the Bears are clicking. SD @ Cle – After the week off the Chargers should have fixed a few of the problems that led to their embarrassment in MNF. The Browns are improved, but not enough. Sea @ Det – Neither team can score, so the Seahawks D should have the advantage. But they’re no good on the road and my gut tells me the Lions will be ready for this one. Jax @ GB – Oh my. This looks to be the most lopsided game of 2012, especially considering the Jags injuries from last week. A Pack loss would be equivalent to a 16 seed beating a 1 seed. Mia @ NYJ – The Dolphins D is no joke, and the Jets are. A loss this week followed by a bye week will lead to a Tebow start in Week 10. Atl @ Phi – The Falcons will lose soon, but it won’t be this week, coming off a bye and facing an Eagles team that can’t score enough points to keep up. Was @ Pit – The net points of these two teams combined is +9. In other words, this will be a close game. The Stillers have the slight advantage and should could out on top. NE @ STL – All bets are off when teams play overseas, so this London match-up is hard to call. The Rams D is good, but Bradford can’t match points with Brady. Ind @ Ten – Might at well pick the Titans at home, as neither team can score or stop other teams from scoring, and Chris Johnson is ready to break loose. Oak @ KC – The basement of the AFC West, the Raiders are winless on the road and the Chiefs are winless at home. So…Raiders I guess, since McFadden in on my fantasy team. NYG @ Dal – A great rivalry and a great match-up. The Boys barely beat an awful Panthers team last week, and the Giants seem to enjoy playing on the road. Big Blue beats Big D.
NO @ Den – Should be the highest scoring game of the weekend & a very entertaining SNF. Both offenses can fly, but the Broncos D is better than the Saints’, so they win a tight one. SF @ Ari – The Cardinals have lost the magic they had at the beginning of the season, and the Niners are a strong team that don’t make a lot of mistakes. MNF means Jon Gruden! I’m very intrigued by this film. It looks odd & interesting, but the trailer doesn’t give much information, which is probably why I’m so curious. Who knows, it could be great, I think it’s worth a shot. After reading The Time Machine (and currently reading The Time Ships), I’ve been speculating on time travel. I think of time as a concept, rather than a physical entity, and therefore, if pressed, I would say that we can’t move forward or backward in time because the past & the future do not exist. However, I like the idea that nothing is impossible, and I also like the idea of quantum dimensions/the string theory/many-worlds. So, perhaps someday someone will figure out something and we’ll be able to traverse time. What do you think? Do you think it will be possible? Do you think that the quantum theory gives a realistic possibility to the idea of time travel?